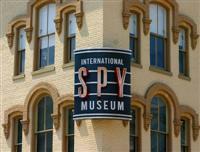 One of Washington's newest museums, the International Spy Museum features the largest collection of publicly displayed international espionage artefacts in the world. It is the result of years of planning and advice by former officials of the CIA, FBI, and KGB, as well as some of the nation's top experts in intelligence. It aims to educate the public about espionage and its significant impact on historic and current events. Interactive exhibits cover the history of spying, famous spies, spying during the World Wars with an exhibit on unheeded intelligence that warned of the Pearl Harbour attack, sophisticated espionage techniques of the Cold War, and the latest spy trends and challenges of 21st century espionage. There is also a section dealing with high-tech gadgets such as bugs, tiny cameras and ingenious disguise techniques, with interactive stations exploring surveillance, disguises, code breaking, threat analysis, and more. There are several interactive exhibits, including Operation Spy and Spy in the City that allow visitors to try their hand at spying; hands-on activities include safe-cracking and conducting polygraph tests, experiences which are combined with special effects and live action. The museum complex includes a restaurant, spy-theme café, and shop. Opening times: Open daily from 9am to 7pm. Admission: $23 adults, $15 youths aged 7 - 11, free for children under six. Other concessions available.